The royal wedding generated an estimated $13 million in incremental retail sales for magazines, a much-needed boost at a time of an otherwise fragile newsstand environment. 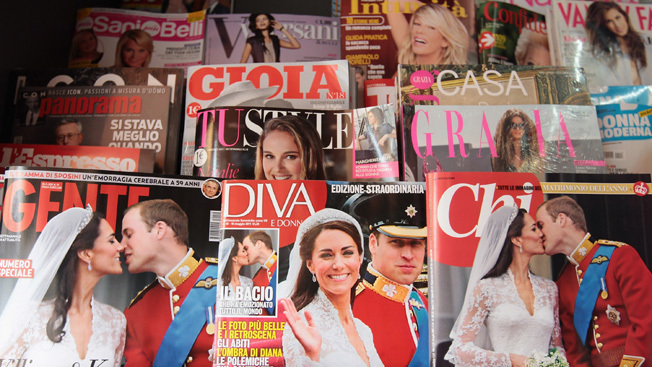 Magazine Information Network, a clearinghouse for magazine retail sales data, estimated that royal wedding-themed covers from existing magazines yielded more than $13 million. Additional specials, one-shorts, and features were expected to bring in another $18 or so million, for a total of $31 million. For comparison's sake, the industry sold close to $67 million worth of product capitalizing on Michael Jackson’s death two summers ago. The royals windfall wasn't distributed evenly, though. Most of the boost went to Time Inc.'s People, whose special collector’s issue sold more than 2.2 million copies, representing $11 million and an 80 percent increase over its average unit sales for the previous 12 issues, according to MagNet estimates. People said the issue was its biggest single-copy seller since its 2008 issue with Brad and Angelina's twins, which sold an eye-popping 2.8 million copies. The other significant big seller cited by MagNet was Us Weekly’s royal wedding issue, which sold more than 900,000 copies, 40 percent better than an average issue. Less successful was Time Inc.’s “Commemorative Special” that distributed 1 million units. MagNet said only that sales were “mediocre,” suggesting that interest in the subject waned during the four-week period the issue was on sale.